I just got back home (as of 5/24, when I first started writing this) after spending Wednesday through Friday at a user group conference in Portland, then Friday night until Sunday afternoon at the coast with my coworkers. The conference seemed like a success, but the best part was getting to meet several of my coworkers who aren’t local and putting faces to the names of clients i’d been supporting. Everyone’s presentations went well, but it was my first user group conference, so I was kind of surprised that it felt like a big “lovefest” for the company I work for (environmental database management software). I enjoyed interacting with all the attendees during the presentations and afterwards over drinks and dinner. When home, I tend to be a bit of a hermit, but I thrive in social situations too. I did feel the need to “escape” and recharge at the end of the conference. Immediately after the conference on Friday, all my coworkers drove to the condo the Veep set us up with in Seaside. The person I rode with stopped to pick up cachaca for someone else and also purchased the best vodka I’ve ever tasted (Reyka, if you’re curious). That first night the little condo was crammed with seven people in cots and sleeping bags, but most left around noon the following day. It was just Lala, Tammy and me for the rest of the time there. We spent our remaining time in Seaside lounging, perusing stores (Lala and I scored some cool hats), relaxing in the huge hot tubs while drinking. 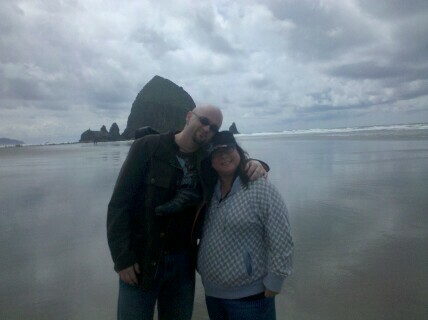 The last day, we drove down to Cannon Beach to see Haystack Rock. 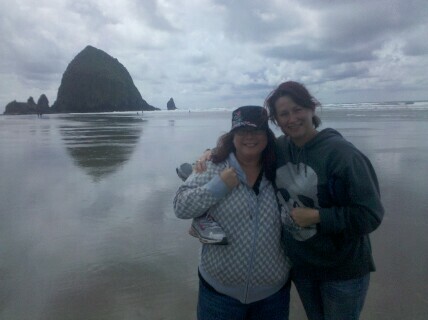 It was fairly cloudy but we kicked off our shoes and strolled down the beach to the huge rock sticking out of the ground right on the coastline. It was much greener than the photos made it look and it was covered in birds. They all took off at once when a bald eagle and it’s young cruised by. Pretty impressive. Right as we headed back to drive home (and the airport for Tammy) the clouds let loose with the rain. It was great having a big chunk of time with nowhere to be or noone needing anything from me. This entry was tagged coast, pics, work. Bookmark the permalink.